Nowadays, my imagination runs toward food. On the treadmill, while watching TV, while driving. I think about desserts and how I can give ones I’ve seen my own twist. I brainstorm. I try to come up with new ideas. When I said I wanted to give crust to more things, I meant it. 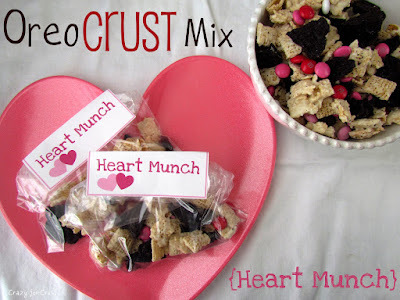 Now, crust is invading my Chex Mix. Yep, I put some crust in there. Oreo crust, to be exact. And white chocolate Chex and M&Ms. Because everything is better with M&Ms. 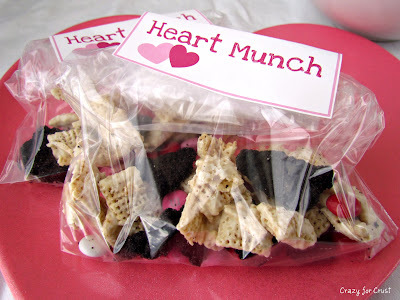 The Elf Munch I made at Christmas was so popular, I decided to package some of it up and call it Heart Munch. The kids loved it. I took it to the park. The moms loved it too. 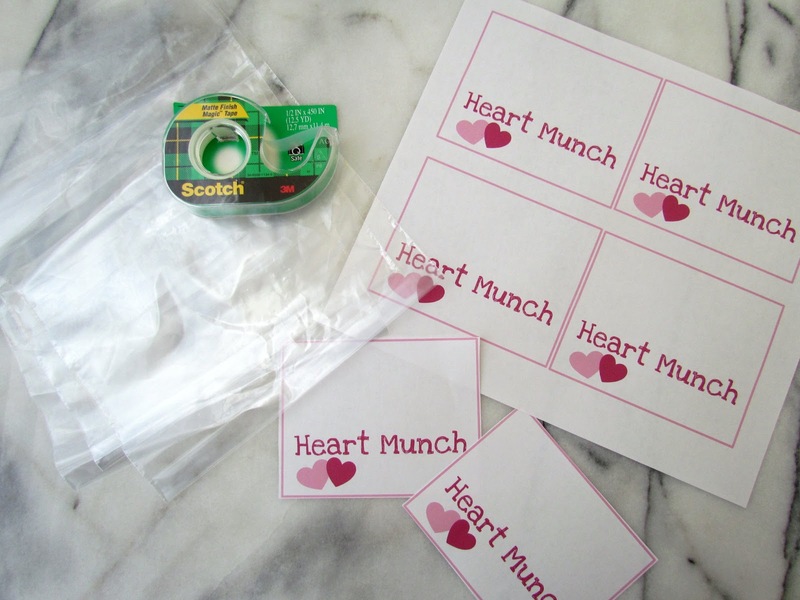 I made the tags the same was as with the Elf Munch. I put the munch in a fold-top sandwich baggie, stapled it closed, and attached the tags with tape. Super easy. I hope my wild imagination is making you happy. Except for the fact that I can’t think about anything but food, I’m enjoying it okay. 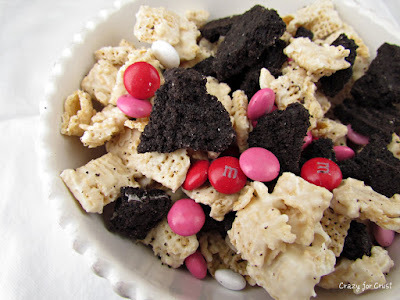 1 cup M&Ms — I used Valentine’s colors, but you don’t have to! Finely crush the Oreos in a food processor. Mix with the melted butter. Line a cookie sheet with parchment paper and press the Oreo mixture into a thin layer. Bake at 350° for 4 minutes. Cool and chill before breaking into pieces. Melt white chocolate chips in the microwave on 50% power in 30 second increments, stirring between. 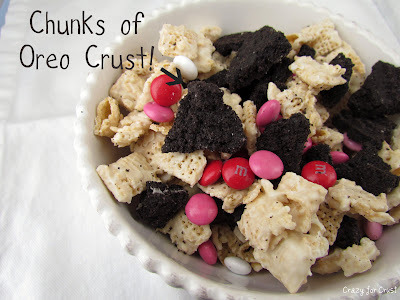 Place Chex in a large bowl and pour melted chocolate over the top. Stir and spread out in a single layer on a wax paper lined cookie sheet. Let harden. Assemble your mix: carefully break crust into bite-sized pieces. Break apart white chocolate Chex. Mix all in a large bowl and stir in M&Ms. Serve in a large bowl or portion into baggies for single servings.